This rare pair of cabinet sized portrait miniatures on vellum are by Richard Gibson, commonly known by his contemporaries as ‘Dwarf Gibson’ on account of his stature. They derive from larger oil paintings by Peter Lely, whose works Gibson frequently copied “in little”. 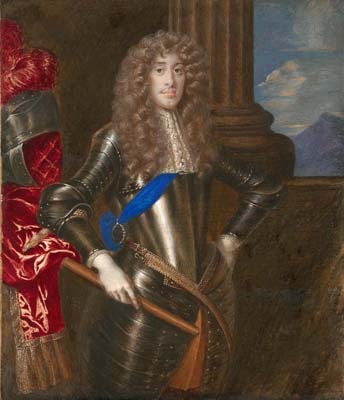 The miniature of the Duke of York is after one of Lely’s best known portraits of him and is a composition that he used for several of his Royal and Ducal patrons. The present miniature is closest to the picture now part of the Suffolk Collection at Ranger’s House, Blackheath. The miniature of Mary of Modena derives from a portrait by Lely depicting her at the age of 16, after her marriage in 1673. The prime version of this picture, now in a private collection, was formerly in the Richmond Art Museum.